I really didn’t know what to expect taking my 8 1/2 year old son to the opera. When I first asked him if he wanted to join me to see Portland Opera’s production of The Barber of Seville, he gave me an energetic and brief “sure!” Did he know what he was in for? I hesitated telling him that The Barber of Seville is sung entirely in Italian, and that it runs well over two hours. I held off on dragging out summary sheets or doing any opera prep work. Part of me honestly believed that all that would scare him off. It’s not all that unreasonable an assumption. There are a great number of people who are intimidated by opera – they live under the misconception that opera is somehow too fancy, unapproachable or requires some sort of pre-requisite knowledge or home work. Hours before the show I decided to pull up both the Woody Woodpecker and Bugs Bunny renditions of “Figaro” on YouTube, figuring I’d give him some sort of context for what he was about to see and hopefully make the experience fun. My son was, as I was as a kid, enthralled. “You know that it’s not going to be like this when we see it”, I clarified. Getting an 8 1/2 year old to ‘dress up’ for anything is a challenge and I explained to him that although there would be people at the opera dressed very fancy, a nice collared shirt and sweater could do the trick. He matched these with cargo jeans and Converse All Stars and voila, Portland kid semi-formal. Going to the opera with my son was a lot like going to a dog park with a puppy – he got a lot of attention. Everyone from the ticket taker to the people we sat next to asked him if this was his first opera and gave him really encouraging comments. As the house lights went down and the music began to play, I leaned over and squeezed my son’s hand, a silent ‘here we go’ and a hope that he wouldn’t be bored to death. Portland Opera’s production of the Barber of Seville couldn’t have been more appropriate for my son’s first opera. The sets glow with bright cartoony colors that look like the performers came to life in a pop-up book version of the opera. The costumes were equally big and colorful, almost something out of the Bugs Bunny version of the opera. The cast of Portland’s Barber of Seville did a fantastic job of filling out their characters beyond the words they sing. Daniel Belcher, who plays Figaro, winks and nods to the audience as if Figaro is so connected to everything in the story that he’s also aware of the audience. Nicholas Phan has a blast with Count Almaviva and his various disguises, embracing the idiosyncrasies of each one. Jennifer Rivera, who plays Rosina, is really the ‘straight man’ of the piece and she nails the performance. Steve Condy is deliciously fun as Doctor Bartolo and seems to be having the time of his life playing the role. The chemistry and interactions between the four lead characters is so good you often forget that they are even signing in Italian. At intermission my son tried to put into words this phenomenon: “Even though I don’t understand the words, I kind of get what’s going on.” For me that’s the sign of a great opera and at that moment all my fears of my son ‘not getting it’ or ‘being bored’ evaporated. The second act of The Barber of Seville is a complete romp. My son cackled at the onstage antics and the cartoony cast of supporting characters, including a brigade of policemen which could have stepped right out of a Monty Python sketch. As the opera concluded and the actors took their curtain call, my son asked me to boost him up so he could see over the all the people clapping and cheering in a standing ovation. I thought it was to quell his curiosity about why everyone was standing, but as he furiously began to clap his hands together I realized he wanted to join along. I’ve been covering arts and entertainment for over twelve years and even I assumed that opera was going to be too tough or too boring for my son. I couldn’t have been more wrong. I don’t know why opera has such baggage attached to it, but it does. For my son it doesn’t. He had an amazing experience with a fantastic performance and as a parent I couldn’t be happier. 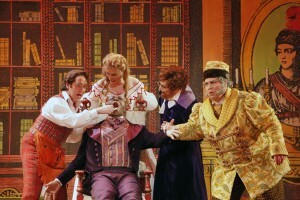 The Barber of Seville runs May 7th, 9, 13 and 15th at the Keller Auditorium.